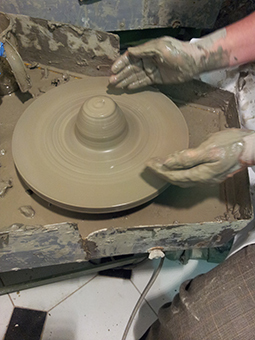 This course enables students to acquire the skills necessary for working with clay through the use of pottery wheel. We begin with practical application in order to study and make the specific hand movements and the use of tools. In this activity is important the perception of moving matter through the knowledge and measurement of gestures and strength. 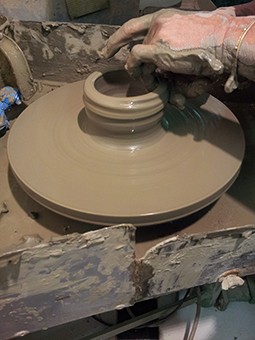 In the first step is learning how to conduct the clay in its center of gravity, and allow her to remain in the balance until the end of the process. After you get used with these items and achieved a good modeling skills, you will go to a more advanced stage which involves copying existing forms so that we can address the issues related to the quality of the building such as: shape, weight, thickness, stages of drying and finishing operations (texture, handles, etc..), suitability for fire. The art of modeling, ancient craft aimed at producing pottery, allows a wide range of applications. 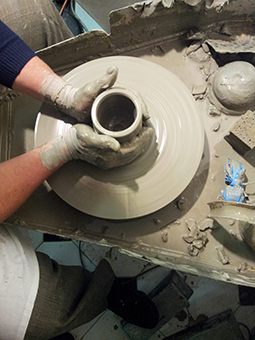 Beyond the learning of a gesture aimed to create an artwork, you can enjoy the making of what is projected not only in the fascinating art of ceramics but even in other expressive arts as sculpture and design.